After 30+ years and hundreds of fishing charters, I have met many anglers who have returned year-after-year to charter the Stray Cat. Novice or expert, we have the fishing trip that’s right for you. Customer service, comfort, and satisfaction have been, and will continue to be, our goals. The following customer testimonials are just a small sampling of the positive feedback that I have received over the years. As a big game, big water, fly fisherman who has spent 25 + years fishing in Atlantic, Gulf, and Pacific Waters, I wanted you to know how much I enjoyed my time striper fishing with you aboard The Stray Cat. I have been on a lot of charters in my life and yours was one of the best. Your ability to put us on fish quickly and professionally, combined with your knowledgeable mate, excellent equipment, and great advice for someone new to New England Waters, made our Stray Cat Charter a pleasant and rewarding adventure. You will definitely see me again. Over the past twenty-five years, I have fished with Captain Ron on the Stray Cat with family, friends, and business colleagues. The fishing for stripers and blues has been consistently great. Some of my best days on the water have been on the Stray Cat. No one knows the Cape waters better than Captain Ron, and no one is better at finding the fish. I am already thinking about our annual family trip for big stripers in July. For our family and longtime friends, fishing with Captain Ron has become a 20 year tradition that remains a linchpin of our summer experience together. Ron is a rare and curious combination of superb fisherman, true gentleman, and genuine human being. Trips with Ron provide, first and foremost, lots of fish and great action. More importantly, he and his family have taught us much and their approach to our family - fishermen and non-fishermen alike - will keep us coming back for another two decades. Ron will always find the fish, but you will come away from your trip a happier and better person for knowing him. My friends and I have been fishing on the Stray Cat every August for the past 7 years. We have had great success catching lots of stripers and blues. The fishing trip is always a highlight of our summer. Our family and friends have had fun fishing with Captain Ron for many years. Captain Ron and his crew know where the large fish are. Every trip we have taken with Captain Ron has been successful. We have had friends join us from all over the country and when we see our friends they always talk about what a great time they had fishing with Captain Ron on the Stray Cat. We look forward to fishing with Captain Ron every summer. We've been traveling from Brookline, NH to fish on the Stray Cat for 10+ years! Captain Ron and his mate Brendan are the best we've come across. We're looking forward to many more trips of fabulous Striper fishing on the Stray Cat! Having started fishing with the world famous Captain Ron Murphy back in the late 70's (I was with Ron on the Cygnet at the time) I am convinced that the good Captain was a concierge in an earlier life. 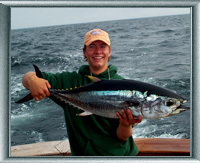 EVERYTHING I ever expected in light tackle fishing has been realized in my many years on board Captain Ron's charters. There isn't anything that I could want while fishing the beautiful waters of Nantucket Sound and Monomoy that isn't thought of before I even ask for it. Ron has even allowed me to catch a very large ( in excess of 38") striper sans rod and reel. I have been on the water with Captain Ron many times every season and I know I have introduced at least 2 dozen new anglers (new fly fishers all) to his incredible talent. They say when a client comes back a second time it is a clear indication of how much they enjoyed their first experience. I can honestly say every single person I introduced to Ron has been back on board the Stray Cat either with other friends that they introduce to the good Captain or with myself to relive a previous excellent trip. I have friends that come up to the Cape every year from NJ, Florida, PA and elsewhere just to be on board the Stray Cat. Too much of a good thing doesn't exist here. Whether you are there to catch the fish of a lifetime or simply enjoy the wonders that are the Cape PLEASE check in with the best Captain in New England. Tell them Bob sent you. You will never be sorry!!!!!!! I have fished with guides from Alaska to Key West and there is no doubt Captain Ron is the best in the business. As a skipper, he is safety minded getting you to and from the fishing area in a safe and responsible manner. As a guide, he is an extremely knowledgeable fisherman. Ron is a run-and-gun skipper vs. one who will go to one spot, sit there all day because "yesterday we caught fish here." Ron understands fish move and the successful fisherman moves with the fish. Finally, Ron is a REALLY nice guy and it is most enjoyable to spend a day on the water with Ron and his crew. Feel free to call me for more information.